WILLOWBROOK, CA (January 12, 2018)—The Martin Luther King, Jr. Community Hospital (MLKCH), a private, nonprofit hospital serving South Los Angeles, has been pledged $15 million from the Weingart Foundation and Ballmer Group in support of the hospital’s affiliated nonprofit Martin Luther King, Jr. Community Medical Group (MLK CMG). The gifts, allocated as $7.5 million from each entity and distributed over five years, take aim at closing South Los Angeles’ critical physician gap, estimated at 1,200 primary care and specialty physicians. The consequence of the area’s physician shortage is felt daily at MLKCH. Since the hospital opened in 2015, its Emergency Department has seen more than double the projected number of patients—and those patients have been younger and sicker than expected. More than half of the patients discharged from MLKCH say they have no regular doctor. Without doctors for the hospital to refer patients to, leaders took it upon themselves to find a way to recruit them—creating the medical group in 2016. "Addressing inequities in our southern California communities is the focus of our foundation's giving," explains Fred Ali, president and CEO of the Weingart Foundation. “There’s a profound shortage of doctors practicing in South Los Angeles. The hospital is exploring a promising way to eliminate that disparity and we're eager help them make progress." The MLK Community Medical Group offers the first viable vehicle in South Los Angeles to attract talented and diverse physicians who want to serve a safety-net community. As a not-for-profit corporation, it’s guided by a mission: to improve population health. This is no small feat in a community where death rates from chronic illnesses such as heart disease and diabetes, for example, are significantly higher than the county average. But the medical group looks to be up to the task. Since its inception, the medical group has generated more interest from physicians than initially anticipated—with many coming from the nation’s best academic medical centers. “What this hospital and its leadership are doing is visionary, and we are proud to support their work,” said Nina Revoyr, Executive Director-Los Angeles of Ballmer Group. “They saw the need to create a financially viable way for physicians to come and practice here and they found a way to make it happen." Founded by former Microsoft CEO and Los Angeles Clippers owner Steve Ballmer and his wife, Connie, Ballmer Group supports data-driven organizations that create opportunities for children and families otherwise likely to remain in poverty. They found philanthropic synergy with the equity-driven Weingart Foundation. Both Weingart and the Ballmers identified the hospital as an agent for change in South Los Angeles. Weingart has previously supported the hospital's establishment of an outpatient treatment clinic as well as its maternity services, and Ballmer Group has supported a variety of organizations in South Los Angeles. "Our hospital is about more than providing emergency care," said Dr. Elaine Batchlor, CEO of MLKCH. "We're changing the health of South LA. 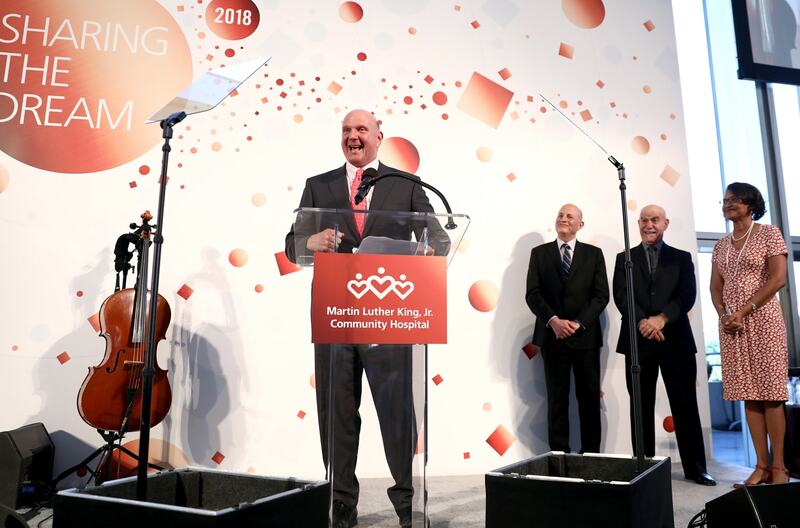 Thanks to the Weingart Foundation and Ballmer Group’s bold investments, we can create a healthcare delivery system that will transform the lives of all of our community members in South LA." Opened in 2015, the Martin Luther King, Jr. Community Hospital (MLKCH) is a private, nonprofit hospital providing high-quality, general acute care to residents of South Los Angeles. Its board of directors is committed to establishing a national model of patient-centered care using technology, data, and innovation to affect population health improvements in safety-net communities. Read more about the hospital at mlk-chf.org. Founded in 1951 by Ben and Stella Weingart, the Weingart Foundation is a private, nonprofit grantmaking foundation that provides grants and other support designed to improve the capacity and effectiveness of nonprofit organizations delivering quality services in the areas of health, human services, and education for people and communities who face the most obstacles to opportunity. With assets over $750 million, the foundation is proud to serve the needs of southern California. More information is available at weingartfnd.org. With offices in Bellevue, WA, Los Angeles, CA, and Detroit, MI, Ballmer Group supports efforts to improve economic mobility for children and families in the United States who are disproportionately likely to remain in poverty.